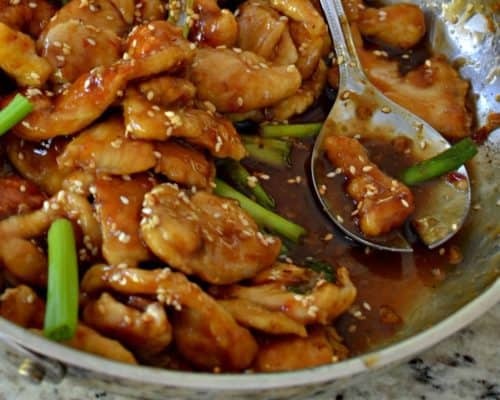 Easy Sesame Chicken Recipe is a family favorite. This scrumptious crispy chicken is both sweet and salty with just a hint of spice. It only takes a few minutes to prepare and tastes so much better than takeout. We love to make Chinese cuisine. So easy to make and tastes so fresh right out of the pan or wok. Do you like Chinese? We just love it. Most Asian dishes are easy to prepare once you learn just a few tricks to the trade. This Easy Sesame Chicken Recipe is one of my favorites and absolutely one of the easiest. You can definitely swing this on a weeknight. How to make Sesame Chicken Recipe. With this recipe I prefer pan fried chicken bites to deep fried chicken bites. Don’t get me wrong I love fried chicken but this is a quick in and out easy recipe. We don’t want it convoluted with a big fried mess. So first simply shake those pieces of chicken up with a little cornstarch in a large Ziploc bag. This will give the chicken pieces just a little bit of crisp. Now simply pan fry them in just a little bit of oil over medium high heat. Meanwhile in saucepan over low heat add a little oil. Cook garlic until fragrant which usually takes less than one minute. Add the soy sauce, rice vinegar, sesame oil, honey and chili sauce. Simmer while you finish pan frying the chicken. Add cornstarch to water and whisk into sauce. Cook until thickened. Wipe out the pan that you were frying in. Turn the heat to medium high and add the sesame seeds and toast. Remove toasted sesame seeds to bowl. Return the cooked chicken to skillet. Stir in sauce and sprinkle with scallions and toasted sesame seeds. Serve over rice or Chinese noodles. This Sesame Chicken Recipe has a hint of spice to it but the honey makes it very mellow. If in doubt add the chili sauce very slowly and taste. Your taste buds will tell you when to stop. Helpful hints when making this honey Sesame Chicken Recipe. Lots of my readers just love lots of sauce. If you are one of these people double the ingredients for the sauce. This recipe is best served right away. If for some reason you get held up don’t combine the sauce and chicken. Save that part until right before you sit down at the table. If the sauce sits too long and gets too thick add 1-2 tablespoons of water at a time until desired thickness. Take a few minutes and toast the sesame seeds. It is well worth the effort. Chicken thighs can be substituted for the chicken breasts. They are just as delicious. Other Chinese Recipes that will knock your socks off! This scrumptious Sesame Chicken Recipe is both sweet and salty with just a hint of spice. It only takes a few minutes to prepare and tastes like heaven. In large Ziploc bag shake chicken pieces and 1/4 cup cornstarch. In large saucepan over medium heat add 2 tablespoons canola oil. Fry the chicken in batches; flipping over to brown both sides. Remove to plate when browned. Fry in batches; adding oil when necessary. In small sauce pan add one tablespoon canola oil. Add garlic and cook until fragrant. Add the soy sauce, rice vinegar, sesame oil, honey and chili sauce. Add 2 tablespoons cornstarch to water and whisk into sauce pan. Cook until slightly thickened. Wipe out the pan that you fried the chicken in. Turn the heat to medium high and add the sesame seeds and toast for 3-5 minutes or until lightly browned; stirring frequently. Remove toasted sesame seeds to bowl. Return the cooked chicken to skillet. Stir in sauce and sprinkle with scallions and toasted sesame seeds. Serve over rice or Chinese noodles. 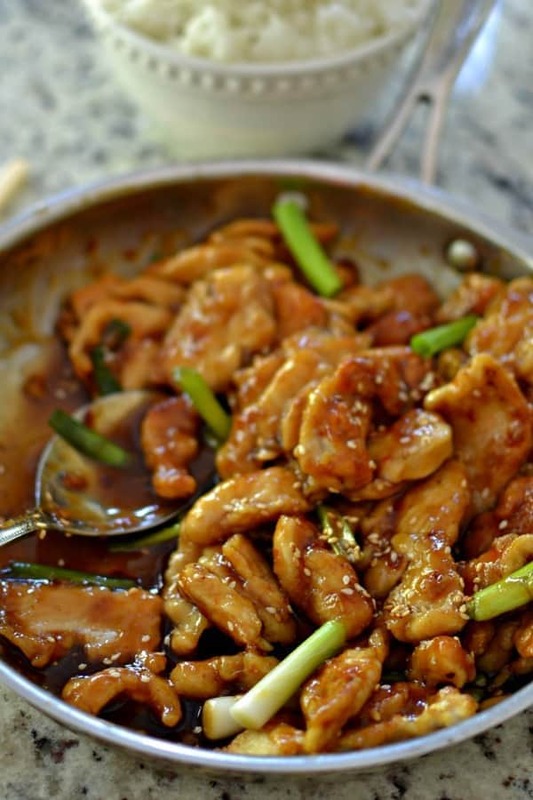 Sesame chicken has always been my favorite Chinese meal so I’m thrilled to find this recipe. It looks easy to prepare and I think I’ll take your suggestion to double the sauce. Also, being able to prepare it ahead of time and add the sauce before serving makes it perfect for entertaining. Thanks! Thanks so much Cheryl. Sesame Chicken is one of my favorites too! So delicious! We don’t have it in the Chinese Restaurants in Sweden, but I eat it every time I’m in USA. My entire family went ballistic over this recipe! We don’t have Sesame Chicken in Chinese restaurants in Sweden, but I eat it every time I’m in Sweden. My entire family went ballistic over the recipe, thanks! So happy that they liked it! So are much too kind with your sweet comments! That is one of those handy recipes I will keep in my kitchen! Never thought of using sesame with the chicken. Oh yes it is most delicious!! This would be so good with rice!! Will try this week for sure. Yummo! I always order sesame chicken when we buy takeout. Now I can just make it for myself. Sesame chicken is quite a favorite in our family & my wife makes it in her own style.Will ask her to check out & try your recipe.Looks nice & delicious. LOVE Chinese food! Sesame chicken happens to be one of my favorites. I look forward to making this! Sesame chicken is one of my favorite things to make because it’s so easy to throw together. Yum! Great recipe! Sesame Chicken is my favorite food! I absolutely love this recipe – I’m adding it to my meal plan! Thanks so much Summer! I am so glad that you like it!! This sesame chicken recipe looks delicious. I wish I have time to cook my own meals….been very busy lately. My husband loves Chinese cuisine. I’ll have to try out your recipe for sesame chicken and make it for him. Awesome! I hope he likes it as much as we do! 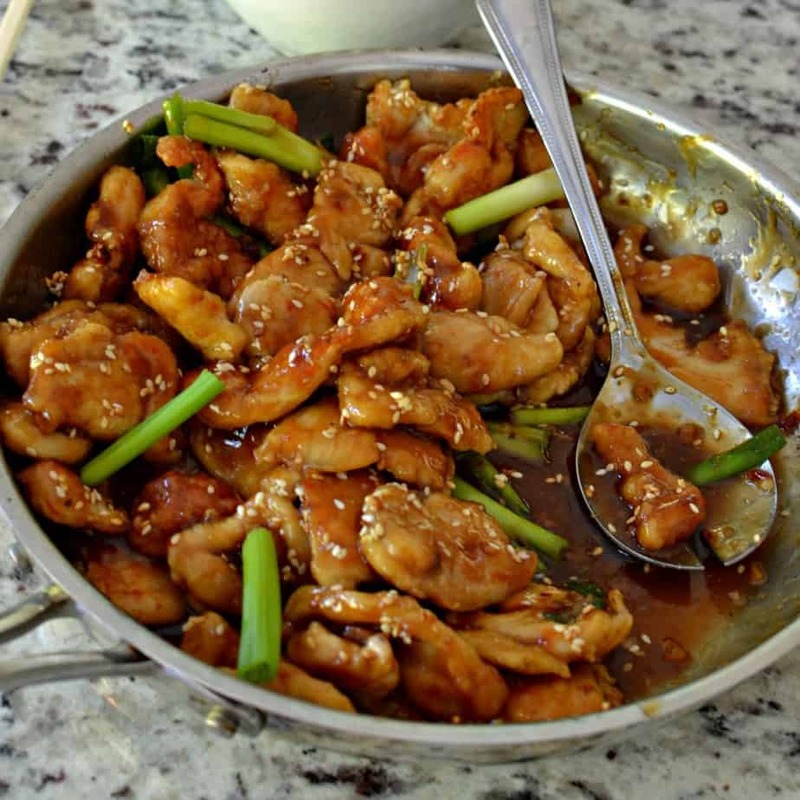 Easy Sesame Chicken Recipe looks like will be a family favorite for me too. I hope I can cook it this weekend. Seems so tasty! This looks like the dish my kids always get at the chinese restaurant near us. I am going to make it for them and surprise them! This recipe looks wicked delicious! It is exactly the kind of meal I order out when I head to the Asian eateries! This is such a great recipe! I’ve never tried making it at home, but can’t wait to try it! This looks so amazing I would love to have this for dinner. It is quite delicious! i hope you enjoy it!! This recipe is delicious, thank you for sharing. Thanks so much Jenny! I am glad that you liked it! I am literally drooling now! This looks soooo delicious, will definitly try to cook it soon. Thanks a lot. 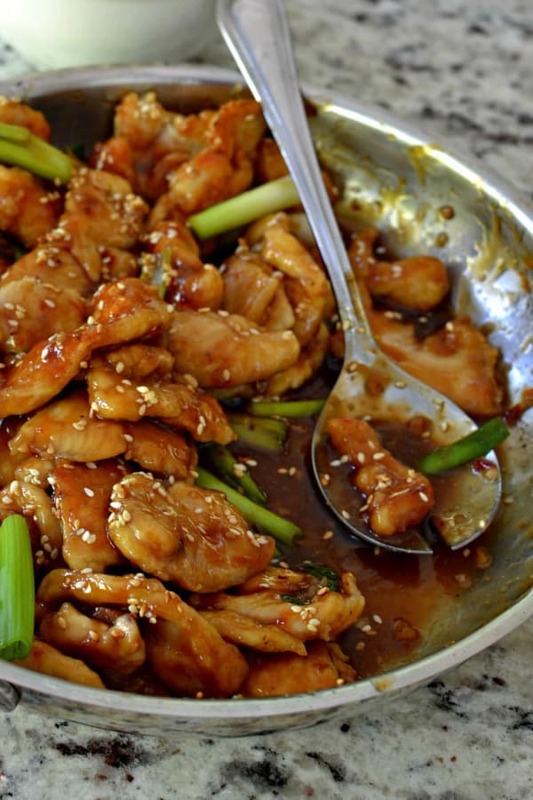 I’ve never actually had sesame chicken, but this recipe looks amazing! I love making Chinese food at home, mainly because I usually have all the ingredients on hand already. This looks PERFECT for a quick meal. This recipe seems to fit us so well as I can imagine having rice with this chicken sesame. I am so happy you have use sesame in this recipe as it really makes the whole thing taste better. This looks so good! Sesame Chicken is one of my favorite dishes ever. I bet it tastes even better when it’s made fresh at home. I absolutely love Chinese food and this looks way better than take out! I can’t wait to make this; my kids will love helping me with the sesame seeds too! So yummy and easy to make.Thanks for sharing. You are most welcome! I hope you enjoy it as much as we do! Oh yum this looks fantastic! My daughter has recently moved out of home and made sweet and sour chicken the other day. I’ll pass this recipe on to her for a meal for next week. Thanks Rhonda! You and your daughter will love it! Yum! 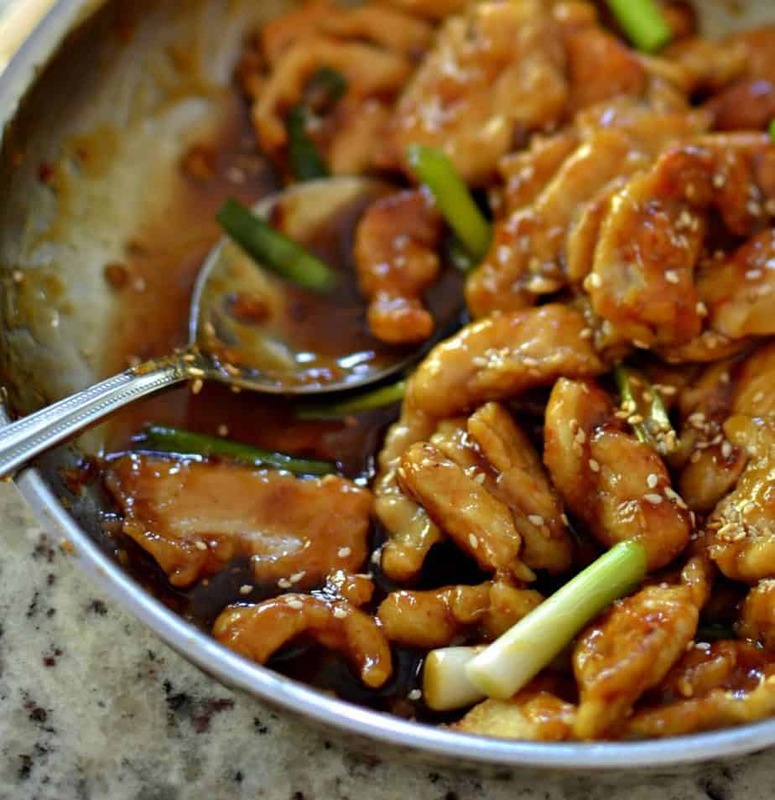 Sesame chicken is one of my favorite things to order from Chinese places, I would love to try making it at home. This looks even better than take out! Printing this for later! I love this recipe for sure, I would add broccoli or kale in the mix. The sauce is definitely the best part so more please, lol! So much better than takeout! My family would love this…perfect weeknight dinner! My pleasure Anne. I hope you enjoy it as much as we do! Nice reading about this delicious looking recipe. I would love to prepare it. Chinese takeout is one of my guilty pleasures, but I love when I can recreate it at home. It’s also much healthier when it’s homemade. I have done a tofu and cauliflower version of this, so vegetarians can still follow this recipe without the chicken! I love me some sesame chicken, YUM! I’ve never attempted to make it myself, but I will now! Thanks Eloise! It is super easy and you will love it!